A Pew Research Center analysis of government data published earlier this month found that 36% of the nation’s young adults ages 18 to 31 — the so-called Millennial generation — were living in their parents’ home in 2012. This was the highest share in at least four decades and represented a slow but steady increase over the 32% of their same-aged counterparts who were living at home prior to the Great Recession in 2007. There is a gender gap within that overall number, according to the study. Millennial males (40%) were more likely to live at home than Millennial females (32%). That 8 percentage point difference is smaller than the 11-point gap that existed in 1968. The growing gender parity in likelihood of residing at home is especially pronounced among 18- to 24-year-olds: 60% of men and 52% of women in that age group lived at home in 2012, an 8-percentage-point gap. 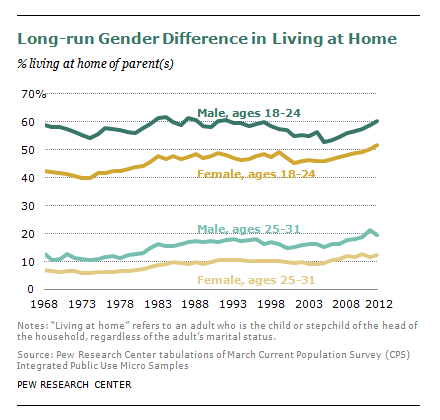 In 1968, 59% of male 18- to 24-year-olds, but only 42% of females lived at home: a difference of 17 percentage points. One factor that has contributed to the growing gender parity in living at home is the rise in the share of young women who go to college. (In the Census data used for our analysis, college students who live in dormitories during the academic year are counted as living with their parents.) In 1968, only 19.5% of 18- to 24-year-old females were enrolled in college, compared with 34% of their male peers. That ratio has flipped; as of 2011, 44% of women and 38% of men ages 18 to 24 were enrolled in college, a 6-percentage-point advantage for women.